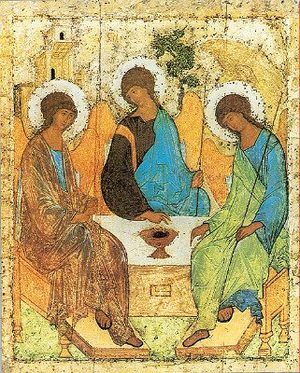 This famous Russian icon of the “Holy Trinity” was created by Andre Rublev around 1410. Those of you who have read my book, It Takes a Church to Raise a Christian, know that icon has been very important in my life. Over a ten year period, a small version of it sat on my desk as I wrote my dissertation and then rewrote it into the book where it is the central image. And it is, I believe, one of the best depictions of the Triune nature, character and activity of God. First a brief word about “icons”. We western Protestants don’t have much familiarity with icons. We tend to look at them as Christian “art” at best and heretical “idols” at worst. But for centuries, even continuing today, icons were used by Christians in the east as a tool for prayer. Let’s be clear about this. You don’t pray TO an icon, you pray THROUGH it. An icon is not an idol. It is not something that we worship, but a tool for helping us worship the one true and living God. In our tradition, the beauty of creation is used the same way. In the same way, that we might go and sit on the beach at sunset and pray to God while watching the light dim and the darkness of night slowly come upon us, an eastern Christian of another day, would set themselves before an icon and use it as a window to God. This is also, by the way, that a lot of us use Scripture as a tool for prayer. In passages like the psalms that don’t teach ethics or theology, as much as they reveal the character of God in his actions with his people, we linger before them, letting them shape our prayers. It’s best to think of it as a kind of window or frame that assists the believer in praying to God. And this one is really unique. Most icons of the Trinity from that day look differently Usually a kingly “Father” figure, a baby “Son” figure and a dove as the “Spirit” figure, they depict the different modes in which most people encounter the Triune God. But this one depicts the Divine Communion of the Trinity. Three figures, who all look almost identical. They are ageless and their gender is almost indistinguishable. They are all seated at a table and all are on the same level. All wearing a similar blue or purple colored robe, all with the same shepherd’s staff, all equally divine, equally regal. The Father figure on the left has a mansion over his head, the Son figure in the center of the table has a tree, symbolizing the cross, and the Spirit figure on the right has a mountain overhead depicting the Spirit’s meeting us in nature and earthly moments. (Like Elijah’s encounter with the “still small voice”). Notice that the Son and the Spirit’s heads are both inclined toward the Father. Notice also how the blue/purple robe symbolizing the divine life is revealed differently by each person in the Triune Community. The Divine Life of God is obscured to us, barely visible. The Divinity of Christ is laid over his earthly garb, because it is through Christ’s humanity that we come to know God and the Divine Life of the Spirit is underneath a green robe that represents the beauty of nature or creation, that invites us to look deeper. And now, notice how the fourth side of the table seems to open up in an invitation. There is a small square that is meant to be a visual device that draws the viewer into the scene. It is as if the Divine Communion, the Trinitarian life of God has made a space at the table for anyone who will come and join them. And ultimately, this is the message of this icon: Will you join the table? Will you become part of this Divine Community? Will you join your life to the life of God? Will you become part of the life of God that we see here is a life lived together. Of course, “essence” is Trinitarian language. Essence is the substance of God, the shared nature of God. No matter how we encounter God, whether through a spiritual experience, the Word of God spoken to us, in the life of Christ or in the beauty of creation, the one true God’s essence is the same, and that essence is a shared love (1 John 4:8-9). The model we have in God is not one of autonomy, but sharing. Of lives that are open to God, to each other and to the world. This sharing is not just out of need or neediness, (for God needs nothing, right?) but a sharing that expresses love through a shared life of authenticity, vulnerability and especially hospitality. What would it mean to live my life as an expression of this Divine Communion? What would it require for me to make my life less autonomous and more “shared”? What would it take for me to whole-heartedly sit at this table? What would I have to do to make my life a more authentic, vulnerable, hospitable extension of this Divine Life? I am reposting my traditional Ash Wednesday post today as we begin Lent together. May the Peace of Christ be with all of us. If you near San Clemente and want to join us, the Service tonight starts at 7 PM. 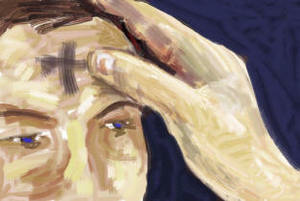 With these words, a small bit of ash is rubbed in the sign of the cross on the forehead of each person. A mark of humility, a sign of mortality, an acknowledgement of repentance. While for many protestants the idea of imposing ashes or even attending an “Ash Wednesday” service is too, well, Catholic, for them, the truth is that what we acknowledge on this first day of Lent is nothing more or nothing less than being human. Ash Wednesday marks the beginning of Lent, a forty day period of “fasting” and spiritual attention that is intended to commemorate Jesus’ own forty day wilderness period of preparation at the beginning of his earthly ministry. During Lent, Christians prepare for the sublime feast of Easter by spending a protracted time in the fast of Lent. At San Clemente Presbyterian Church, we will begin Lent with a dinner together in our fellowship hall. Then after dinner, an Ash Wednesday Service where two invitations will occur: 1) Everyone, young and old, whatever age and stage of life will be invited to come and receive the imposition of ashes, and 2) Every Christian, young and old, whatever age and stage of life, will be invited to come forth a second time and receive the Lord’s Supper. By coupling these two moments—one a tradition, the other a sacrament—we wish to convey a clear message: the starting point for all spiritual progress, all spiritual attention, all spiritual discipline, is in the acknowledgement of our own genuine humanity and receiving God’s generous mercy. Like two blades of a pair of scissors both are needed: humility and grace, the truth of our mortality and the gift of eternal life, remembering that our bodies were fashioned of the dust and that the God of the universe took on the same creaturely form in order to bring us to life eternal. And in receiving both the ash and the sacraments, we complete our first act of repentance. The focus of Ash Wednesday and Lent is repentance. Again, many of us are confused about repentance. Some of us think of it as “penance,” that is, atoning for our sins with acts of contrition. But that is not repentance. We can’t atone for what we have done and need not try. Jesus’ work on the cross is our atonement. Some of us think of repentance as sorrow and shame for what we have done, but that is also inaccurate. Indeed, as I will explain in another post, the bible has a different Greek word for sorrow. And it all begins with this: Remember that you are dust, and to dust you shall return. You are not an angel. You are not a mere soul or disembodied spirit. You are human, you are mortal, you are deeply dependent on the God who formed your body from the humus of the earth and breathed life into you with his kiss. God has come to you, in Jesus, O Creature, and called you to have life eternal with him. And so, with ash on our foreheads and the taste of bread and grape on our tongues, we begin a holy lent. Reposting another entry from a past Lenten season to remind myself (and anyone else) of the kinds of spiritual disciplines that make for a holy Lent. Hasten slowly. Here is a paradoxical spiritual discipline that I want you to consider practicing with me this Lenten season: Practice hastening slowly. So, let’s consider how we add breath to our haste, how we create a rhythm for living--even when busy--that includes slow, focused, lingering moments of prayer, of attention, of love. Many of us start our days by hitting snooze. By the time we get out of bed we are already 15 minutes late. The rest of the day is nothing but a rush to catch up. I have begun thinking about my day ahead. And if it is particularly busy, starting it even more slowly. I begin most of my days a good hour before any one else in our house wakes up. This is my time to putter, to pray, and to ponder. I get up, I make myself coffee, I check my email. I then settle into my favorite chair to read, pray and doing some writing. This slow start is the key to my whole day. When I skip it, I spend the day rushing from one thing to another. This idea of beginning the day slowly was reinforced for me when I started doing in endurance training for triathlons, marathons and century bike rides a few years ago. I soon learned that longer you are going to ride or the harder you are going to run, the slower and easier you needed to begin that ride or run. In endurance training the rule is if you want to go fast later, go slow earlier. Build a strong base, warm up, start slowly. In many ways, that is what the group of us who fill our church's Stephen's Chapel each Friday morning in Lent are doing. One day a week, we are coming together in a candlelit chapel, spending 30 minutes listening to music in prayerful contemplation. And then for 30 more minutes we practice Lectio Divina together, considering the sermon text for the following Sunday. So, here is the first thing to practice: begin the day slowly. And let me add, even if you have to start the night before. Start slowing down as the sun goes down. Think of your day as starting at sun down the night before. This is, as some of you know, the Jewish way of counting a day. Sabbath starts on sundown and continues until the next sundown. It is a deeply biblical way of thinking about our days. It means that the day begins with going to sleep. The day begins with resting. God is the one who works all day and then stands guard all night. Only God. Humans have to have a rhythm of rest. Indeed, when God became a human, Jesus slept just like the rest of us. I am re-posting my traditional entry for Ash Wednesday today. May we all observe a holy Lent. If you are in San Clemente and would like to join us, our Ash Wednesday service is at 7 p. m.
Today, we begin Lent. May this season of spiritual reflection and learning be used by the Spirit to so work within the Church that it may be said that in each gathering, big or small, high church or low, that the prayer of Jesus was being fulfilled: "Thy Kingdom come, thy will be done on earth as it is in heaven." By coupling these two moments—one a tradition, the other a sacrament—we wish to convey a clear message: the starting point for all spiritual progress, all spiritual attention, all spiritual discipline, is in the acknowledgment of our own genuine humanity and receiving God’s generous mercy. Like two blades of a pair of scissors both are needed: humility and grace, the truth of our mortality and the gift of eternal life, remembering that our bodies were fashioned of the dust and that the God of the universe took on the same creaturely form in order to bring us to life eternal. And in receiving both the ash and the sacraments, we complete our first act of repentance. The focus of Ash Wednesday and Lent is repentance. Again, many of us are confused about repentance. Some of us think of it as “penance,” that is, atoning for our sins with acts of contrition. But that is not repentance. We can’t atone for what we have done and need not try. Jesus’ work on the cross is our atonement. Some of us think of repentance as sorrow and shame for what we have done, but that is also inaccurate. Indeed,the bible has a different Greek word for sorrow. And it all begins with this: Remember that you are dust, and to dust you shall return. You are not an angel. You are not a mere soul or disembodied spirit. You are human, you are mortal, you are deeply dependent on the God who formed your body from the humus of the earth and breathed life into you with his kiss. God has come to you, in Jesus, O Creature, and called you to have life eternal with him. And so, with ash on our foreheads and the taste of bread and grape on our tongues, we begin a holy lent. Through Lent, I will be posting portions of The Heidelberg Catechism (as well as finishing up my series on Revolution or Retreat and the marks of the true church). This first Sunday of Lent, we begin with the first two questions of The Catechism. The Sunday messages on The Heidelberg Catechism Questions 1, 2 will be available Sunday afternoons until Easter here. I am re-posting the entry for Ash Wednesday last year today and will be continuing the current series on Revolution or Retreat with the next post. Starting tomorrow, I will also be adding some daily posts from the Heidelberg Catechism to focus our thoughts and deepen the anchors of the Christian faith that we hold dear. This is the second part of my message from last Sunday on the "Spiritual Discipline of Suiting Up." It's a bit lengthy today as I thought I'd wrap up this section before the weekend. 18 One day as Jesus was walking along the shore beside the Sea of Galilee, he saw two brothers—Simon, also called Peter, and Andrew—fishing with a net, for they were commercial fishermen. 19 Jesus called out to them, “Come, be my disciples, and I will show you how to fish for people!” 20 And they left their nets at once and went with him. In a church like ours, we have constant needs. Needs for Sunday School teachers and greeters, worship leaders, small group leaders, Stephen ministers and the like. But what we really want are people who feel called—at least for this season of time—to be part of a particular ministry that is bigger than they are. We don’t just want lots people who are responding to the needs, we want people who are heeding the call of Jesus. If we all heed the call, all the needs will be met. So how do we heed the call of Jesus? How do we practice the spiritual discipline of suiting up, of standing ready to hear and heed Jesus’ call to join him in his ministry in this church and to a hurting world? First and foremost by recognizing what a call from Jesus sounds like. So, let’s begin by looking again at the way Jesus called these disciples, these four who assumed, like you and I often assume, that they wouldn’t be called to do anything but sit on the sides and cheer on others. And what we find will help us to “suit up”, to ready ourselves for something bigger than ourselves, to open ourselves to the call of Jesus in your life. So, since Jesus called four disciples, let me offer you four points. When we focus on meeting needs, we focus on what we can do, what we have time to do, if we have space to do it. But the call of Jesus is different from what we expect. My friends, I believe that we can be hear different calls in different seasons of life, but the call to follow Jesus, to dedicate yourself to Jesus, to participate in what he is doing in the world, usually comes as a complete interruption to whatever else we may have planned. Look at these four would be disciples. The text reminds us that they are “commercial fishermen.” They were not some brothers killing time on a vacation, but were hard at work making a living taking care of families. And when Jesus calls Peter and Andrew it was “while they were fishing,” right in the middle of the day. It seems crazy, but that is exactly what he did here. And I can’t tell you how many people have told me over the years how the call of God in their lives to a particular, meaningful ministry completely rearranged their lives and plans. Being a fisherman is hard work, and it is unpredictable work. If the nets have holes, the fish aren’t going to be caught. So this is a particularly busy time for these two men. It’s like being an accountant and the call of Jesus comes to you during tax season. Further, to be a fisherman in the first century was a lucrative job. They made good money. And when James and John are called by Jesus and they not only leave behind their business, they leave behind their father, Zebedee. Even in the first century this was understood to be a most radical decision. Sons are expected to stay in the family business at least until the father dies. Most scholars assume that Jesus himself didn’t start his ministry until he was thirty because he waited until Joseph passed away. Instead, he stayed home working as a carpenter until his time came. But when Jesus himself calls these particular men, he calls them from their father and his business. The call of Jesus comes and inconveniences an entire family. But it is a call from Jesus, so they go. Jesus’ call includes partners for you. Notice how Jesus calls these men in pairs. Notice how both brothers are called to follow him. This is the normal way of operating in the kingdom, the call of Jesus is almost never to go it alone. Just think of all the pairs and teams we find in the New Testament. Jesus and the twelve; Peter, James and John, Barnabas and Paul, Paul and Silas, Paul and Timothy, Barnabas and Mark, Priscilla and Aquila, and on and on. This reminds us that the call of Jesus is always a call to community. When we follow Jesus, we follow together. Very often as a pastor, I’ll get an idea that I think may be call for me or for the church. Instead of running off and doing it, I have learned to pray and ask God to reveal someone else who should be my partner in it. If there is no partner, no sense of community, no shared responsibility and accountability, then I assume that there is not yet a call. Jesus’ call invites you to follow Jesus more closely. In essence that is what the invitation of Jesus does, it takes our eyes off ourselves. That is also why the need is not the call. When I am focusing on meeting needs, I am focusing on what I can do, what I can accomplish, what I can achieve. When I following Jesus, Jesus is then my focus. This is, dear friends, the most important point of all. Jesus doesn’t just call you to use you. He calls you to be with him, to be close to him, to have your life so entirely transformed that you will become more and more like him. A genuine call of Jesus to an opportunity to be part of his amazing ministry is an opportunity to be with Jesus and do what he is doing. Early in ministry I went on a retreat and the leader asked us to spend some time in quiet and imagine that Jesus was in front of us. Just imagine that Jesus had walked right up to us and asked us this question: What can I do for you? The retreat leader said, in prayer, reflect on your life and your ministry and consider, what is your request? What would you want him to do in your life and ministry? I have to tell you that many things crossed my mind: Would I ask him for a big ministry, a famous ministry, a successful ministry? Would I ask him for more resources, more opportunities? What did I really want? My friends, that remains my deepest prayer each day. All I want is to be doing what Jesus is doing in the world. I want our church to be a community of people who are all ready to do whatever it takes to follow the call of Jesus into the world. Suiting up is readying yourself to become part of something bigger than yourself. It’s not necessarily responding, but it is readying. So, you may be asking: What do I do to practice the spiritual discipline of suiting up, of readying myself for a particular call from Jesus? Well, here it is: Try on the suit. Most people don’t discover a genuine specific call from Jesus overnight. It usually takes awhile for those of us who have been so used to being spectators to even hear the call to “suit up” and get in the game. And in the course of our lifetimes we may be called to a number of different specific callings in different seasons. So, in order to be a person who is committed to something bigger than yourself, who is open to the call of Jesus that will rearrange your life, develop the spiritual discipline of trying on different “suits” to see what fits. As you serve in this church or in the world, use it as a time of trying on the suit and considering your own calling. Use these last days of Lent to consider what Jesus did for you and what you can do in return. What do you think you might be called to do? Where is Christ putting a passion in your heart a desire in your soul? Where do you feel his “nudge”, his tap on the shoulder, his invitation to follow him more closely and be part of something bigger than yourself? Is it a ministry with the poor? Is it a mission trip like we are taking to Africa? Is it a ministry of hospitality with our friends at Camp Pendleton? Is it learning how to share the gospel with unbelievers, defend the faith to skeptic or teach the faith to eager new Christians? Is it passing on the faith to the next generation? Is it mentoring young families? Or leading a small group? Is it being part of the leadership of this church or a particular part of our mission to the world? Maybe some young people in our church need to consider a call of becoming a pastor. Or maybe it is something that none of the rest of us have even thought of. My friends, what do you want to attempt for God in your life? You may not hear a specific calling at this particular moment. But it is time to open yourself to Jesus call in your life, using your specific gifts and unique talents. It’s time to “suit up” and be ready to be put in the game.